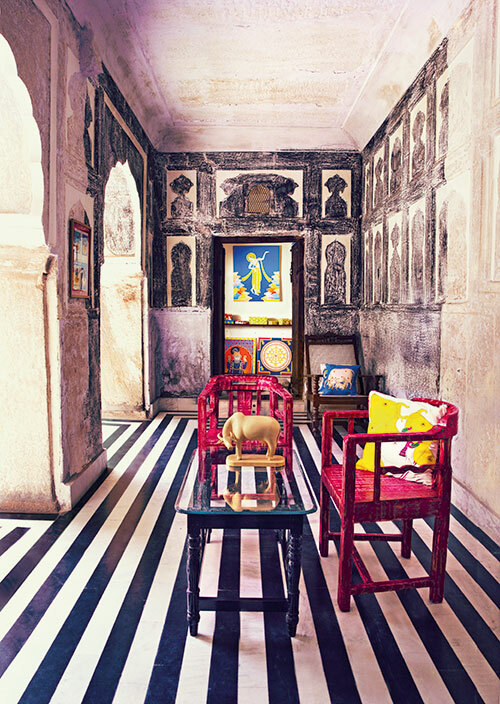 Kishangarh, off the Jaipur highway, on the fast-lane expressway, quintessentially juxtaposes modern and rustic India. Step off the highway and you are in the midst of a dated, urban village caught in time. Wherever the eye travels you can see ironsmiths, traditional textile sellers, potters and silversmiths pottering away at their work. Camels, ornate rickshaws, women clad in lehengas and men in jhablas and elaborate pugris dot the landscape. 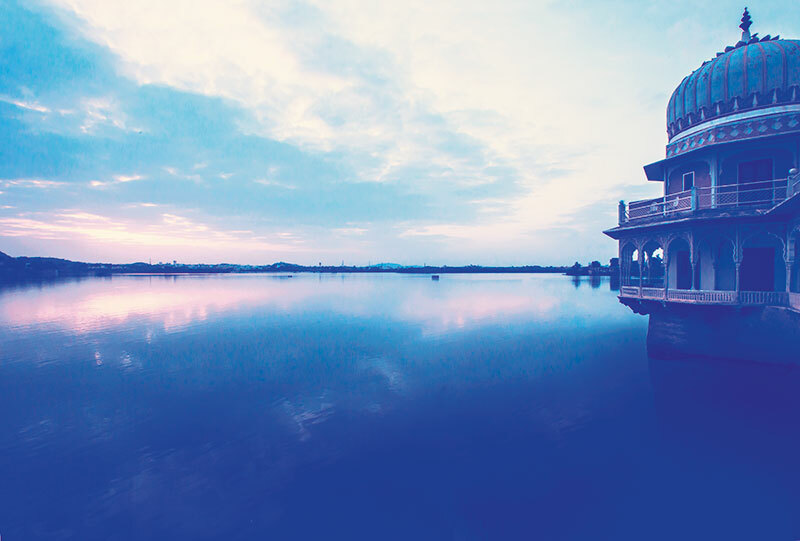 A drive along the lakeside towards the Kishangarh Fort takes you to the picturesque Phool Mahal Palace, summer home of the erstwhile royal family and today a quaint, little heritage hotel which is also a perfect show-case of Princess Vaishnavi Kumari’s experiments with miniature art. She and her gracious husband Padmanabh welcome you with inherited dignity. 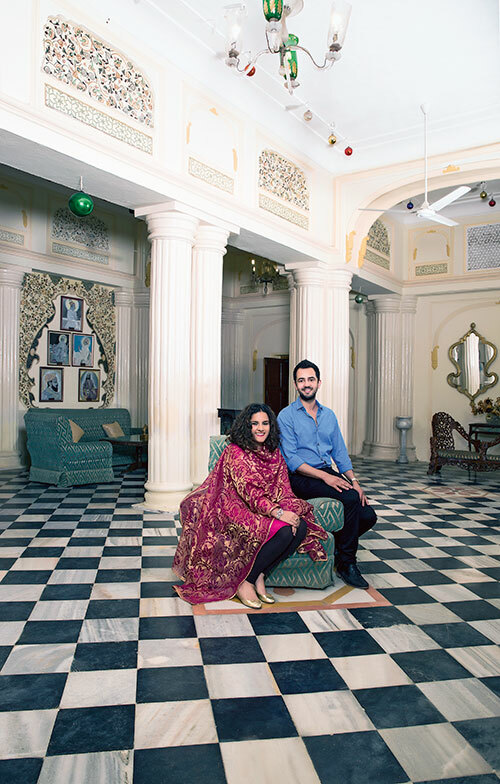 A fun-loving couple who are true friends to each other, the two spend their time between Rajasthan and Gujarat looking after each other’s heritage, whilst Vaishnavi aims to give hers a sharp, modern design twist. Padmanabh plays cricket for his state, when not sharpening the family’s vintage car collection. A post graduate student of art at SOAS University, UK where she studied Asian art; a graduate in design from NIFT and an alumnus of the British Museum where she did a short course in art history, Vaishnavi has re-discovered her inherited legacy of Kishangarh miniatures, personified by celebrated paintings like that of the Kishangarh Radha and the Bani Thani, a portrait of the slave princess, often referred to as the Indian Mona Lisa. It is in Phool Mahal that you see the fabled miniature art of Kishangarh literally come alive. Each room is designed like a canvas that you can walk into. Fresco art at its finest blends with 3D elements in hand-painted wood. Like the cow painted with very linear black and white stripes or the parrot in bright green that stands next to a typical Ashoka tree that features extensively in miniature art. Or the very romantic oval room where Krishna and his gopis grace the wall in an ultimately beautiful fresco. “This was the family’s summer home. The lake lent an air of calm and cool in the hot summers and the fort walls gave it a nice shade. 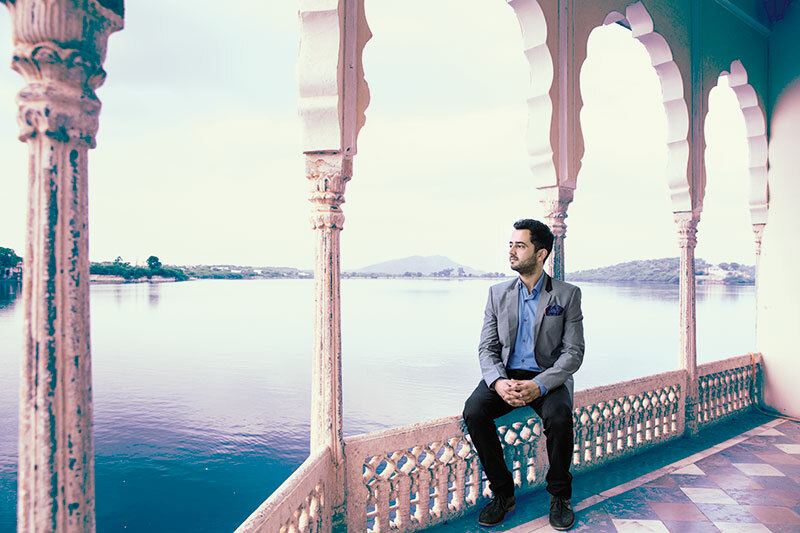 Designed like a British manor with a few ethnic elements like arches and jharokhas, the Phool Mahal fort has a view of the lake from every room. 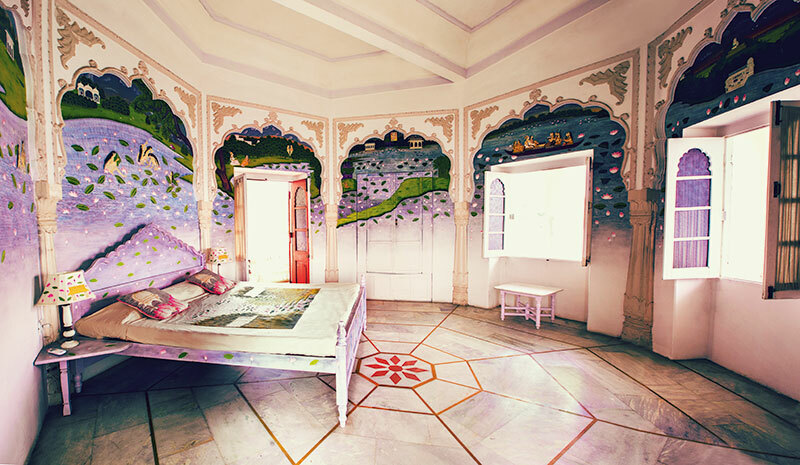 The drawing room is filled with portraits of the earlier Maharajas, hand-painted by resident artists. Vintage knick knacks from the family’s collection like old silver, some rare pottery and crystals, stuffed tiger busts to reminisce old hunting exploits and an old throne in silver grace this space. The bedrooms and suites around the palace are filled with old, colonial furniture: chaiss longues, four-poster beds, love settees and coffee tables. It is also here that Vaishnavi houses her pet project: The Kishangarh Studio working closely with the few surviving practitioners of miniature art. 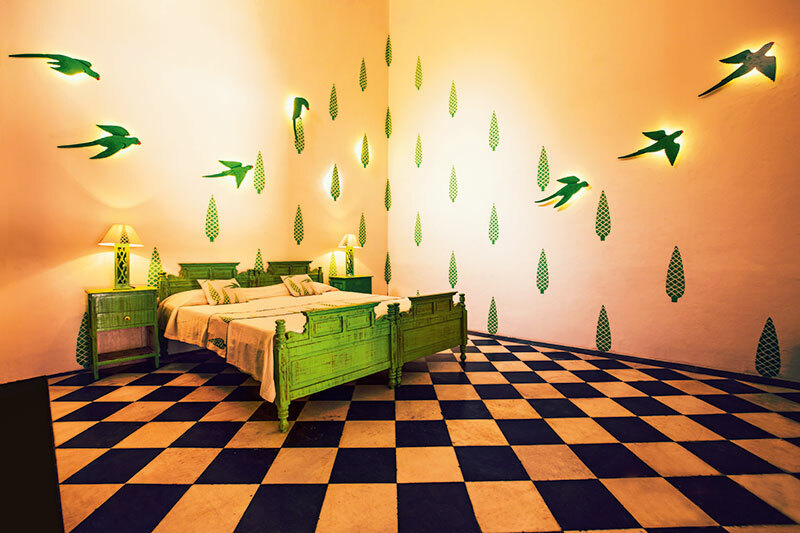 Situated at the foot of the Kishangarh Fort surrounded by the lake, the studio always has a few artists in residency, painting away, getting inspired by old cameos, giving each a modern, zany, pop art twist. One of the greatest examples of this was the patron-artist relationship between Nihal Chand master artist and Raja Sawant Singh (c.1748-1764), which in a brief span of 30-odd years added a completely new dimension of art to Kishangarh’s history and even established an atelier. It was his patronage which culminated in India’s most celebrated paintings, the Radha being the most iconic today. Art has to mirror society. It has to blend seamlessly into your lifestyle and Vaishnavi achieves this by creating a perfect amalgam of traditional techniques and modern colours, placements and forms. Creating mugs, cushions, trays, table knick knacks, she reinterprets watercolours, inlay work and oil on canvas with a funky new vocabulary. She says, while aiming to be always current, “It is this old-into-new technique that is the strongest statement of The Kishangarh Studio.” And also the most engaging bastion of this young princess’ life.